A small Norwegian company is developing an aircraft that aims to take advantage of the "best of two worlds": the Vertical Take Off and Landing (VTOL) properties of a helicopter and the high-speed potential of a fixed-wing plane. The SiMiCon Rotor Craft (SRC) concept utilises a circular fuselage shaped like an aerofoil containing retractable rotor blades that extend telescopically from the disc as they spin up to speed for vertical take-off and landing. When in the air, the SRC's jet engine takes over and the rotor blades retract into the circular wing cavity for fixed wing flight. The rotor blades can be extended mid-flight if the craft needs to hover and sideways thrust from the jet engine or a small tail rotor is being integrated into the design to prevent the entire place "spinning like a top". SiMiCon has recently performed tests of the aerodynamic characteristics of circular disc-shaped wings in cooperation with the Norwegian Marine Technology Research Institute and the Norwegian University of Science and Technology. Research is still in its early stages and the concept is not expected to fly for several years. 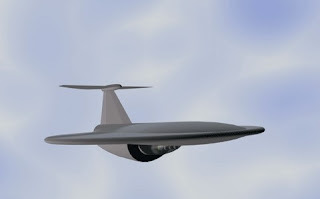 Most Unmanned Aerial Vehicles (UAVs) employ a fixed wing design like that of a traditional plane. But these designs offer limited maneuverability and payload capacity, require a runway to takeoff and land, and are unable to hover. Vertical Take Off and Landing (VTOL) UAVs get around these problems, usually by employing rotors like a helicopter. 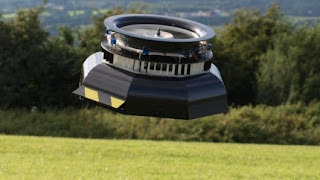 Now UK-based company AESIR has developed a VTOL UAV that has no external rotating parts, instead relying on a phenomenon known as the Coanda effect to generate lift. Although the video shows a small model there are three different sizes of this craft, one of them capable to carry 10 tons.